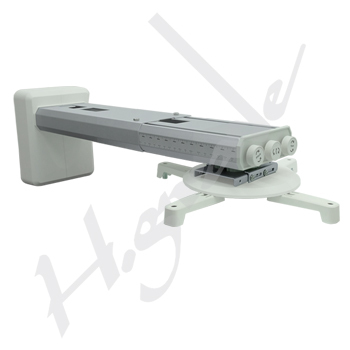 Short Throw Projector Wall Mount, PCA744 - HIGHGRADE TECH. CO.,LTD. To be inherited by in-depth know-how on hinge for years, Highgrade Tech. has constantly endeavored to be a professional provider on various Mounting Solutions for flat displays. No surprise, Highgrade Tech. has responded the upcoming needs from latest ultra short throw projector series which 3 axis adjustment mechanism has been well introduced. This latest projector mounts have especially designed for the new generation short throw projectors at a max. weight support at 10 kgs – to meet an emerging demand on latest interaction applications. On top of that this wall mount kit has a stylish telescope arm design and a lightweight aluminum construction. This shall make STP Mount sturdier & reliable along with adjusts to be used. This versatile wall mount has been featured with precise 3-axs adjusts for up-to-date fine tune for applications and fitted to most Short Throw Projectors. Auxiliary measurement cursors have been well marked at both sides of telescope ARMs which installer can measure the length at an accurate manner. Cables shall be fully well organized inside the telescope arms and they shall be concealed organized at a clean finish. All the efforts we made have directed to ensure safe & easy use on this versatile universal mount for Short Throw Projectors.